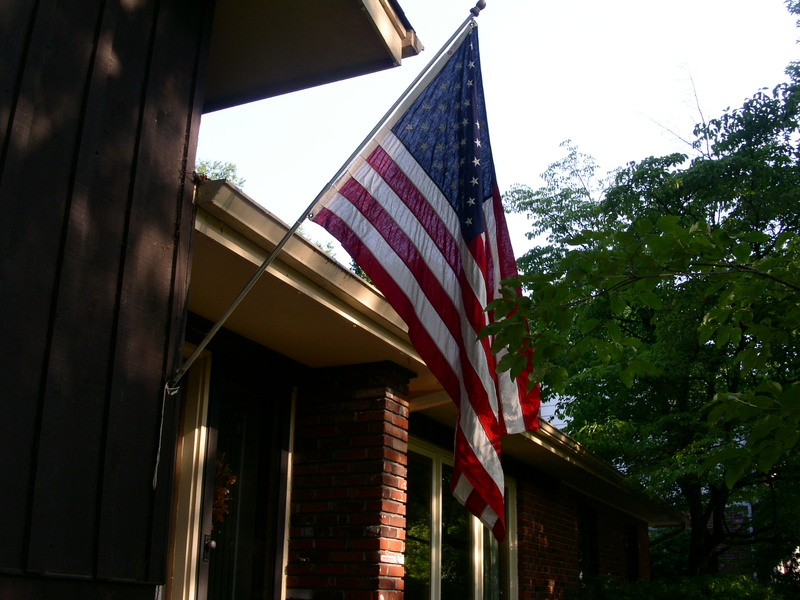 Our flag is up for the 4th of July weekend. Always a beautiful sight: the red, white and blue against the green trees and blue sky. The flag is a symbol of all that our country stands for, hopes for, strives toward. Even those of us who are called progressives or liberals have a love of country (and a love of God). But it’s a love as one loves a child, filled with expectations that it will grow and mature, that it will be a force for good. That it will care about all people, and especially care for many whenever it is a necessity. Liberals tend to not have a blind, flag-waving patriotism filled with exclusion and indifference toward any and all who fail to measure up or toward those who fail to march to the tune we hear rather than their own. Nor do we hold a patriotism embracing exceptionalism. As I hear exceptionalism, it carelessly and recklessly manifests itself through a global entitlement free of any sense of wrongdoing. An entitlement to deal with others through a heavy-handed and punitive diplomacy. We liberals seem to have a sense of gratitude rather than privilege. Liberals exhibit compassion toward those who struggle. We recognize the difference between “won’t” and “can’t” when thinking about benefits and assistance for the poor, homeless, physically and developmentally disabled, jobless, sick, and those subjected to abuse and discrimination. I never met a poor person who was in it for the money. Liberals aren’t afraid of foreigners, gay people, Muslims, immigration. In general we are a pretty understanding and accepting bunch, comfortable in our own skin … most of the time. If you can, listen to talk shows on the right and on the left. Which one finds it necessary to yell and scream, as though talking louder makes any more sense? But those who scream outrageous and unfounded comments do have their followers, and their followers do vote. Often against their own self-interest, but they do vote. Some of the talk show hosts on the extreme right confuse Nazis, fascists, socialists. It’s a shame. Otherwise they would have seen how far we were being driven into becoming a fascist state during the 2000 – 2008 time period. What was going on was much more intentional and vigorous than the current administration is (perceived to be) moving toward socialism. It will be interesting to see whom the Republicans choose to help rid the White House of those black people. So far, there isn’t one I would trust roaming those halls. Anyone who doesn’t think race is behind the obstruction and lack of cooperation in an effort to have President Obama be a one term president, doesn’t get out much. “Take our country back” means what? if not a thinly veiled display of white privilege. Many think Obama is doing a lousy job, completely forgetting about the alternative. Oh, boy! Wouldn’t we be having fun now with the McCain/Palin leadership team while McConnell and Boehner kneel before the throne. My congressman, Todd Akin, says liberals have a “hatred for God.” That’s funny. Most of the liberals I know are quite the opposite. One only has to look at which party cares about whom, which party really follows the social justice agenda of most major religions, to draw some conclusion as to where God fits in one’s life. Take any piece of Republican legislation and see if it helps people who need help. Of course I mean current day Republicans, not those who used to be committed to moving the country forward. Our flag will fly all weekend. Maybe Grover Norquist’s pledge-puppets will work all weekend. Perhaps wisdom won’t take a holiday. But let’s not hold our breath. This entry was posted on July 2, 2011 at 2:21 pm and is filed under politics, Social Justice. You can follow any responses to this entry through the RSS 2.0 feed. You can leave a response, or trackback from your own site.